A discussion with the artists featured in our Strange Fevers exhibit this spring. Adolescent girls are often the subject and impetus for strange and violent occurrences—everything from poltergeist activity to the Salem Witch Trials. This discussion delves into the power and agency of teen and pre-teens throughout popular culture and art, as well as how artists in multiple genres use this particular trope to explore new paths into our understandings of feminism, theory, and culture. 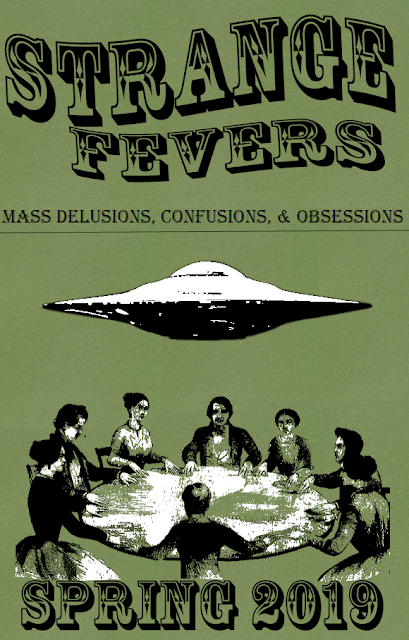 Sit back as we delve into the world of all things delightfully weird--science fiction, urban legends, ghosts, monsters, and explore mind-twisting work of all genres. Join us for a roundtable discussion and learn about the artist collective/ project CCS, developed in 2017 and dedicated to crypto related shenanigans in the Chicago area. Share stories, lore, and explore the boundaries between art and hoax, information and disinformation. worst of the best. 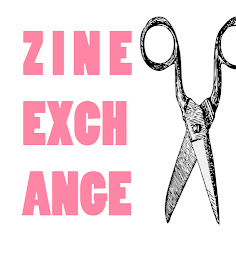 Snacks & zine-making included! 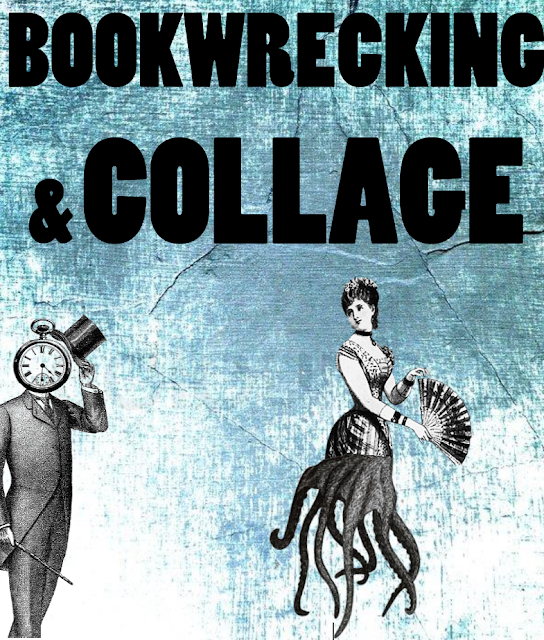 Join the library for an evening of bookwrecking & collage making. We will have discarded library materials and ephemera on hand, as well as scissors, exactos, adhesives, and other supplies to make your masterpiece. How To Tuesdays are a series of workshops and artmaking experiences that highlight certain subjects and areas within the Columbia College Library Collection--areas that are an excellent resource for practicing and developing artists. 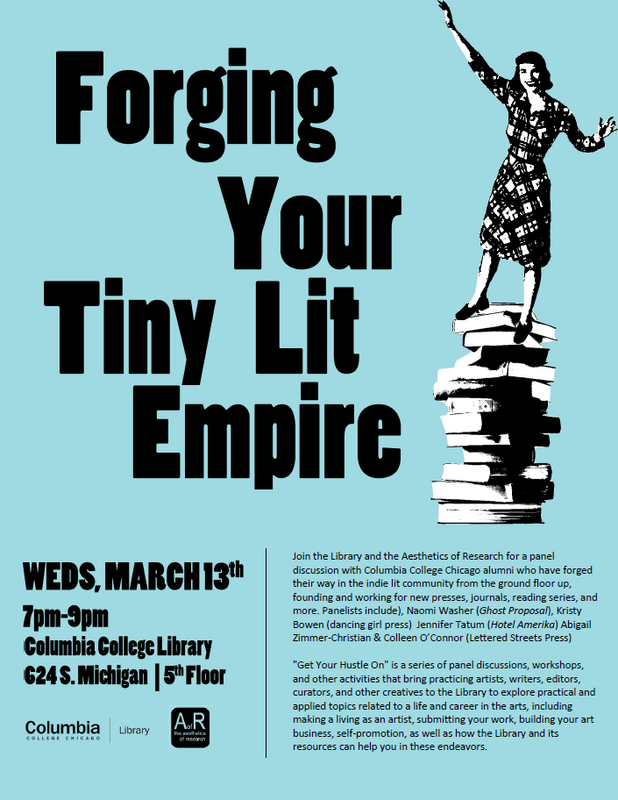 Join the Library and the Aesthetics of Research for a panel discussion with Columbia College Chicago alumni who have forged their way in the indie lit community from the ground floor up, founding and working for new presses, journals, reading series, and more. ABIGAIL ZIMMER is the author of girls their tongues (Orange Monkey Press, 2017) and two chapbooks: fearless as I seam (Dancing Girl Press, 2014) and child in a winter house brightening (Tree Light Books, 2016), which received the 2016 Poetry Award from the Chicago Review of Books. She is editor of the Lettered Streets Press. NAOMI WASHER is the author of two chapbooks: Phantoms (dancing girl press) and American Girl Doll (Ursus Americanus). She is also the translator from the Spanish of Experimental Gardening Manual: Create your own habitat in thirty-something simple steps by Sebastián Jiménez Galindo (Toad Press). Her work has appeared in Gold Wake Live, Pithead Chapel, Asymptote, Passages North, Essay Daily, and other journals. She has received fellowships from Yaddo, Vermont Studio Center, Studio Faire and Chateau d'Orquevaux in France, and Columbia College Chicago where she earned her MFA in Nonfiction. She is the founder and editor-in-chief of Ghost Proposal, a post-genre literary journal and chapbook press. COLLEEN O'CONNOR received her MFA in Nonfiction from Columbia College Chicago. She is the author of the chapbooks THE PRETTY THING TO DO (Dancing Girl Press) and CONVERSATIONS WITH ORSON (Essay Press). Recent work has appeared in Glittermob, Pinwheel, and Barrelhouse, where her essay "Cautionary" was a featured novella-length essay. She lives in Chicago where she was recently the managing editor of the feminist poetry press Switchback Books, and is currently an assistant editor of Hotel Amerika and co-editor of The Lettered Streets Press. A writer and book artist, KRISTY BOWEN is currently a Library staff member and co-curator (with Jennifer Sauzer) of the Aesthetics of Research initiative. She received her MFA in Poetry from Columbia College in 2007. She is the editor/designer or dancing girl press & studio, which publishes a series of chapbooks by women authors. Her work has appeared recently in Hobart, Paper Darts, and Tupelo Quarterly. She is the author of a number of chapbook, zine, and artist book projects, as well as several full-length collections of poetry/prose/hybrid work, including SALVAGE (Black Lawrence Press, 2016) and MAJOR CHARACTERS IN MINOR FILMS (Sundress Publications, 2015). "Get Your Hustle On" is a series of panel discussions, workshops, and other activities that bring practicing artists, writers, editors, curators, and other creatives to the Library to explore practical and applied topics related to a life and career in the arts, including making a living as an artist, submitting your work, building your art business, self-promotion, as well as how the Library and its resources can help you in these endeavors. 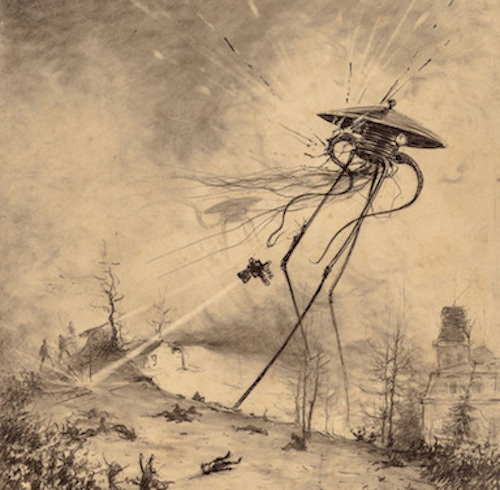 Join us next week for our first Book to Art Club meeting of the semester, as we continue our discussion of HG Well's War of the Worlds and work on our final zine project due out in May. Stop by to contribute to the project and check out our first floor display devoted to this classic and all it's visual embodiments. Started by the Library-As-Incubator Project, the Book to Art Club is a book + art-making club that exists virtually and in-person at libraries around the world. Our selection for this year is HG Wells' War of the Worlds, a story told time and again through various media--films, comics, radio. Come for some general discussion (of both the book and other incarnations) and make some art. At the end of the year, we will turn our collective endeavors into a book art/zine project in time for the Manifest Celebration. The Columbia College Library invites panel & roundtable proposlas for our very first Artists & Scholars Colloquium taking place on Saturday April 13th. This years theme is STRANGE FEVERS: MASS DELUSIONS, CONFUSIONS, AND OBSESSIONS. We intend to delve in to the strange world of public madnesses through the lens of art, culture, politics, and entertainment.From propaganda hoaxes to Victorian Spiritualism. Cults to crop circles. Fake news to Sasquatch. Witch hunts to urban legends. Satanic Panic to Beanie Babies. E-mail proposals and questions to kbowen@colum.edu. Join the Library and The Aesthetics of Research for this year’s Breton’s Birthday celebration, honoring everyone’s favorite father of surrealism. 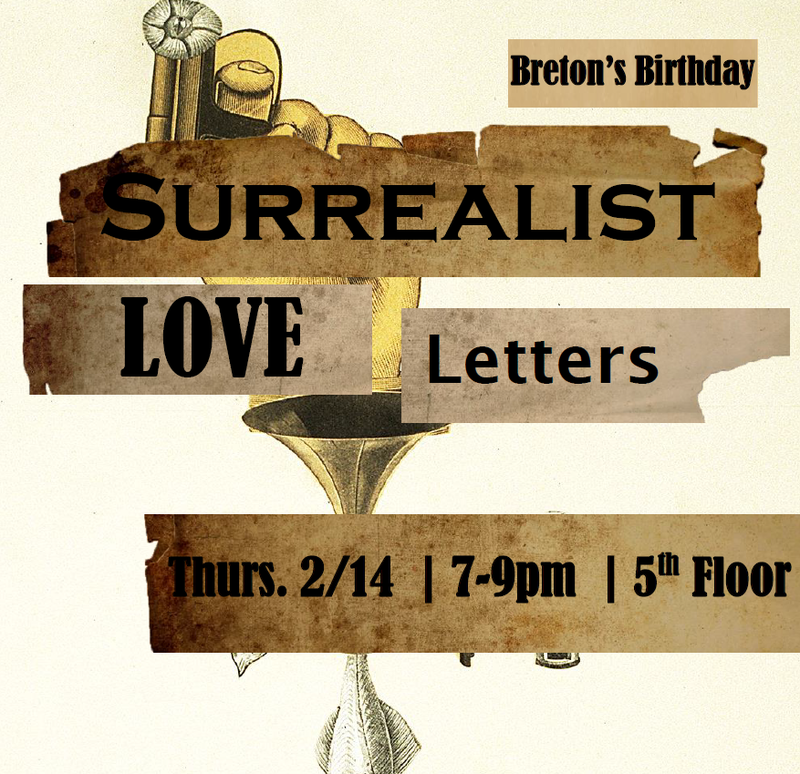 This year, we are combining two of our favorite February doings—surrealism and love letters! In honor of Breton and Valentine’s Day, we will be featuring a handful local authors followed by an open mic session, offering everyone the chance to read their strangest, most bizarre and delightful missives. From the heartfelt to the heartbroken, the hilarious to the horrific. Sign-up for the open-mic portion begins at 6:30 p.m.
Next Tuesday! 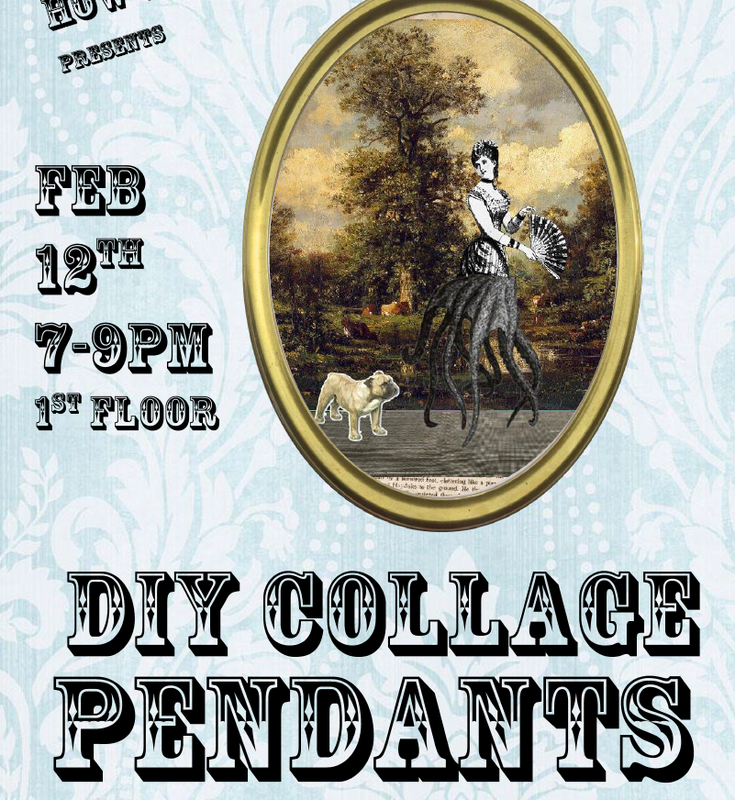 DIY Collage Pendants! How to Tuesday presents DIY COLLAGE PENDANTS!! Just in time for gift-giving, we are offering a chance to turn paper and glass into tiny artful trinkets perfect for your Valentine…we will have supplies and materials on hand to make the perfect piece of one-of-a-kind jewelry. Make use of our collage stash or bring your own photos and/or paper to use. The Aesthetics of Research is an ongoing project dedicated to exploring the role that libraries and their collections play in artistic process, creative community building, and resource sharing in the arts.